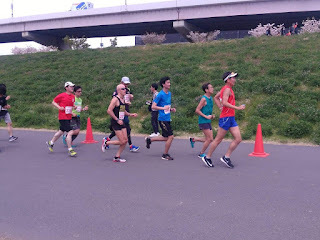 Ran the Adachi Goshiki Sakura Half Marathon today. Adachi is an area of eastern Tokyo where the Arakawa river is, goshiki means five colors and sakura are cherry blossoms. I guess they have five kinds of sakura along the river. Three other club members and I ran it and it was hot!! I was aiming for about 1:45 — 5:00/k pace, but assumed I would slow down after 15k, which is exactly what happened. Finished in 1:46:56, not bad, considering the heat (24C, bright sun) and that I hadn't run for 6 weeks in Feb/March and hadn't trained much for the race. It was a nice race - maybe 300 in the 10k, 5-600 in the half. Lots of enthusiastic staff and pacers for about 7 different groups from 4:00 to about 7:00 per k. The pacers helped me a lot. The course was a 7k out and back, run 3 times. Photos: With 5:00/k pacers and then starting to drift behind them at 16k. 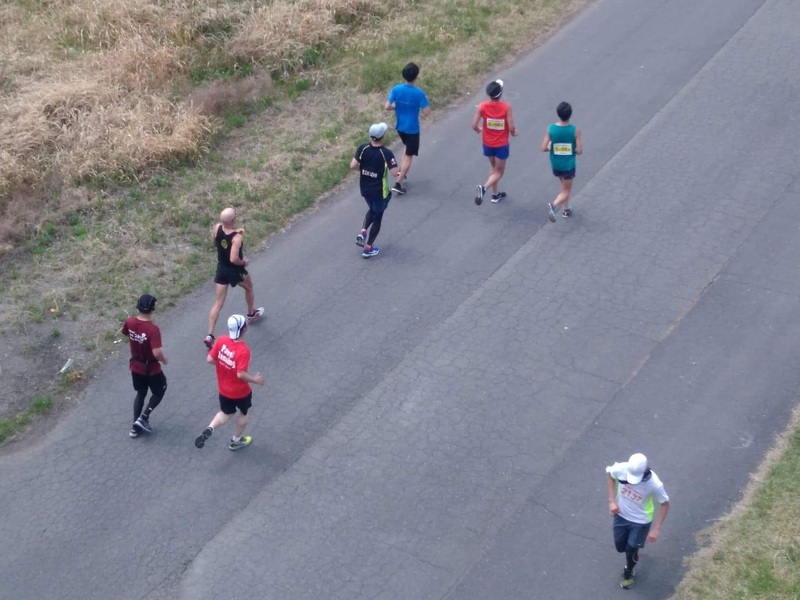 Thought you might be interested to know that the first parkrun in Japan was held on April 6. It was held along the Tamagawa river, a little ways south of central Tokyo. It was well attended - 343 people - and was a success, except that the first 20 runners got mis-directed and only ran 3k. 343 was quite good, since it wasn't promoted much to the Japanese running community - mostly on Facebook to English speakers. My club had 30 people there. It's too far from my house for me to go often (and I don't like running in the morning), but anyway, it's nice that parkrun made it to Japan. Oh, and Paul Sinton-Hewitt, the founder of parkrun, was on hand for the first event, so that was cool. My hamstring has healed - no pain at all for the past 3 weeks. I have a Half on Sunday, which I'll be able to run, but not at a quick pace. Too bad, as I had hoped to be in good shape for it, but happy that I'll at least be out there. Spent the end of December and early January training well, then went to Singapore on the 15th to visit my daughter. I love Singapore, truly love it - would move there if my wife would agree, but that will never happen. And I especially love it in the winter, as I hate cold weather. So I had a great time running in the Botanic Gardens, which is only 2k from my daughter's apartment, and did two Parkruns — East Coast Park and Bishan. Interestingly, my time at both was exactly the same: 21:42. I guess that's what I'm capable of early in the morning, at 27° and 85% humidity. I worked hard at both of them, too. Also, I broke the age group records at both places, although...I hope I don't sound like I'm bragging, but 23:something was a pretty soft record, for me, anyway. They were my first Parkruns, and yes, they're really nice events. Surprisingly, Parkrun will come to Japan in April, despite various obstacles, such as there being no parks in central Tokyo where you can have one. Apparently, they've found two parks in the suburbs, so we'll see if they catch on. So....after returning, I rested for two days, did an easy 8k run and the next day (Sunday) went out for a 20k run. I thought this would be ok, as I had been doing 26k runs before going to Singapore. Well, it wasn't. At 18k my right hamstring started to hurt, badly enough that I immediately stopped. Tried a bit of a jog on Tuesday, still sore. Managed a slow jog Friday, but stopped at 4.5k rather than the planned 6k. Will try another slow jog on Monday. Very annoying, and unexpected as well. You just never can tell, can you? I really don't think it's serious, but, well, annoying. Fortunately, I don't have a serious race until mid-April, with a short 7.5k ekiden in March. I'd like to blame it on the cold weather — I should go back to Singapore! 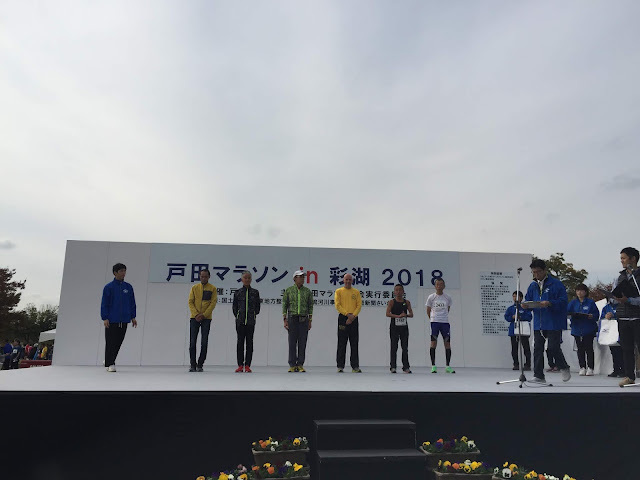 After resting for 5 days after the half marathon on Nov. 18th, I ran easy for 5 days, rested for 2 days, and ran a 7.4k leg on one of Namban Rengo's Okutama ekiden teams. This was the 6th leg (out of 6) and was slightly up/down the first half, mostly down, then flat the second half. I ran well, timing 30:40 (4:09/k) and felt good. Passed 2 runners, but passed by 4. Weather was good, about 14° and cloudy. This was 30 seconds faster than I ran 2 years ago. The club had 4 men's teams and 3 women's teams, so it was a lot of fun. The ekiden is out in the hilly, wooded countryside about 90 minutes west of central Tokyo. 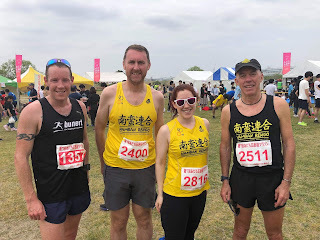 Our A team, which I loaded with fast runners, all of whom run 16:00 or under for 5k, came in 7th, our best showing since 1991. 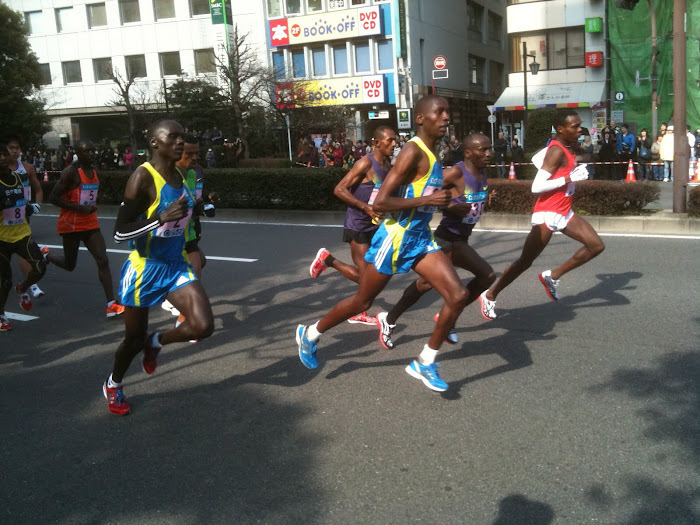 This is a high level ekiden, with several very fast corporate and club teams. Getting in the top 10 is an impressive accomplishment. The top two women's teams came in 12th and 14th, also good as there are quite a few fast university and high school teams. After a few easy days, I got back into regular training, although I'm not planning to run a race until April. Have decided I have to train harder/longer, thanks to being inspired by Gene Dykes, who recently broke Ed Whitlock's 70-74 AG record with a 2:54 marathon. His applicable quote is: I train hard. So...back to doing long runs once a week, along with a tempo run and an interval workout. With a 30k run that would be 83k per week. Today I did 24k in 2:24:55, 6:08/k out and 5:56/k in. Felt ok. Surprisingly, this was my longest run since June 17, 2013. I really got away from doing long runs and I think doing one once a week will be good for my strength and endurance. I'd like to run a good half marathon in the spring. Merry Christmas and hope you will be running well in 2019. 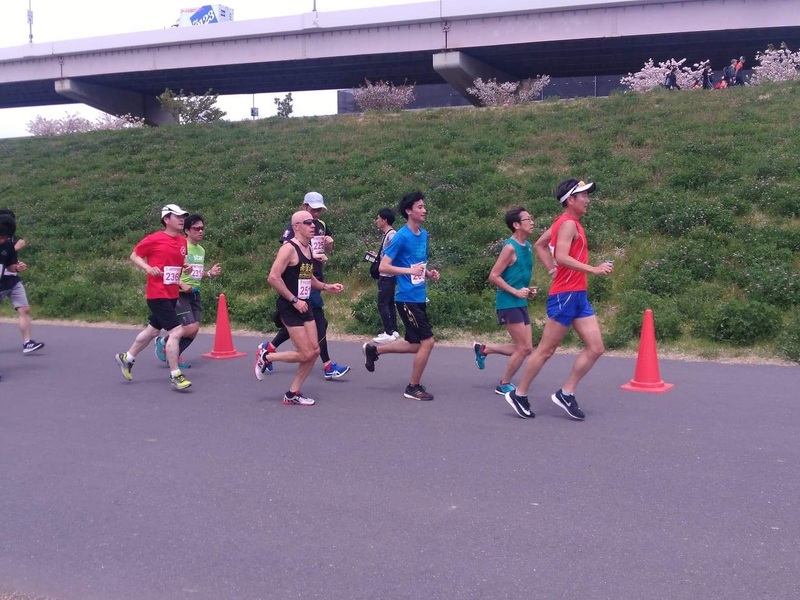 My A race, the Toda Half Marathon (just north of Tokyo), was on Sunday, which was a perfect day for running, about 15°C, sunny and no wind. I was targeting 1:35, which is 4:30 per k. Actually, I wanted to run 4:30 pace and then speed up to about 4:20s for the last 6k, and that's exactly what I did. Felt pretty comfortable at 4:30, within 4 seconds either way. There's a turnaround at 15k and I like to pick up the pace there. Last year I actually slowed from there, but this time the legs felt ok, so I sped up a bit: 4:19/24/19/22/26 and 4:44 for 1.1, which is 4:18/k - managed to kick in slightly. Prizes went down to 6th, so I got a nice shoe bag. It was a fun day, the club had 20 people there, most in the half, some in the 10k, and everyone did quite well, with a few others winning prizes. There were 2,800 people in the Half (283 in men's 60s), so a decent-sized race. And 1,700 in the 10K. Of course, compared to 70-year-old Gene Dykes, who recently ran a 1:22 half, 1:34 is, well, good but not great. Gene apparently does quite a bit of overdistance, even 50k and over ultras, so maybe increasing my weekly long run to 24k and then 30k will put more strength back in my legs. Of course, I used to do that, so I think I should go back to that. Since I don't like winter races, I won't run another half until maybe April, so let's see what happens then. Dec. 2nd I'll run a 7.4k leg on an ekiden team, then no races for 4 months. Hope to be in Singapore for part of the winter, visiting my daughter. It's been one month since the 10K race, and now 10 days until the half marathon. Training has gone pretty well, with no aches or pains, which is very nice! And the most important thing for good training. I said I wanted to start training harder, so have been doing the usual track intervals on wednesday nights, a half marathon pace tempo run on Saturday and a long run on Sunday, with minor variations. I'm very wary of doing anything hard after a race, but after 3 days rest out of 5, was brave enough to try a 5K "race" on the high school cross-country course on the saturday after the 10K. They decided to let coaches run in the junior varsity races this year, so I decided to see what would happen. The result was pretty good — 20:58 on a quite tough course featuring two very long hills. Of course, you get to go down the hills also, but I think the uphills slow you more. Then, interestingly, did an 8k tempo run the next saturday at 4:29/k pace. My pace during the 10K race had been 4:31/k. That's the difference between 34°C (93F) and 21°C (70F). Then did a 20k run the next day at a decent pace. The next Saturday was a 10k tempo run, also faster (45:04) than what I ran the race in. 22°C and of course my legs were not as rested. 18k run on Sunday, two easy days and the 5,000m time trial on wednesday, which I did in 20:42. Was hoping to go faster, but it was ok I guess. Then Sunday the 4th was our club 10K/Half and BBQ, where I ran the 10k as a tempo run in 45:17. Yesterday's intervals were 6 x 1000 in a little over 4:00. So...if I can run two 45-minute 10ks and then another k, that would be a 1:35 half. I'm not completely confident about that, but I'll give it a shot on the 18th.